By Perry P. Perkins Having spent much of my f-f-fifty years camping, hunting, and fishing, I have gleaned a number of essential skills and tips on the subject that I feel it’s my duty to pass on to the next generation of outdoorsmen and women . . . assuming we can wrest the X-Box controllers from their pale little hands and drag them outside. So, when I finally had my own child, I was really excited to introduce her to the joys of being outdoors. In fact, she went on her first camping trip at three weeks old. Of course, at three weeks old, she was basically a big loaf of bread dough with eyes, plus we brought approximately forty-seven thousand baby-care items with us. 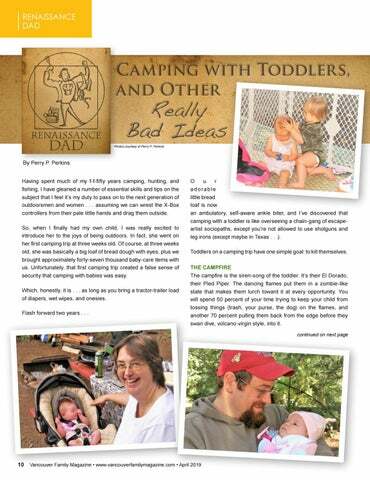 Unfortunately, that first camping trip created a false sense of security that camping with babies was easy. Which, honestly, it is . . . as long as you bring a tractor-trailer load of diapers, wet wipes, and onesies. Flash forward two years . . . 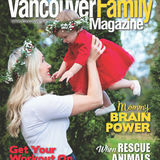 The magazine for Southwest Washington families.